No member shall take unfair advantage of any other member of the LACDCS (Los Angeles County Disaster Communications Service) and will conduct themselves in accordance with the rules, regulations, policies, and guidelines of the Organization. All members are to conduct themselves in such a manner as not to bring discredit upon themselves, the Disaster Communications Service, or the Los Angeles County Sheriff’s Department. Each member must possess personal integrity. They must be honorable people to ensure safety, fairness, and the proper use of available resources in their undertakings. 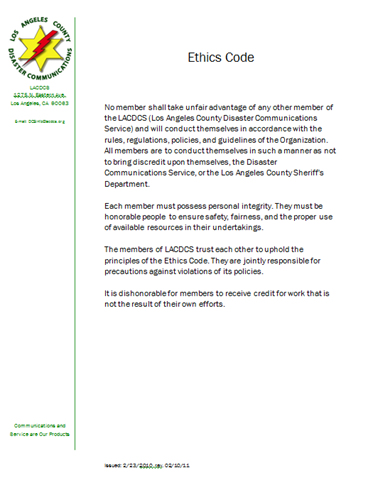 The members of LACDCS trust each other to uphold the principles of the Ethics Code. They are jointly responsible for precautions against violations of its policies. It is dishonorable for members to receive credit for work that is not the result of their own efforts.